Psednocnemis brachyramosa (West & Nunn, 2010) is a very beautiful species from the montane tropical rainforest slopes in Gunung ledang, Johor, West Malaysia. The name is derived from the Greek “brachy”, which means “small”, and the feminin Latin adjective “ramosa”, which means “branching”. This last part in the name is referring to the unique spermathecal morphology. Spermathecae are uniformly sclerotized and uniquely branching. Adult females show an incredibly beautiful intense iridescent blue coloration post-molt. In earlier stages of life, the spider won’t be as colorful. The coloration of adult males is completely different and rather dull in comparison. The spider was formerly known as Coremiocnemis sp. blue. Don’t confuse the spider with the orange/brown Psednocnemis jeremyhuffi. Subfamily: Selenocosmiinae. Psednocnemis spp. differ from all other Selenocosmiinae with bilobed spermathecal morphology. Common name: Malaysian blue femur. Previous names: Coremiocnemis brachyramosa West & Nunn, 2010. Type: Psednocnemis brachyramosa is a burrowing species. Origin: Gunung Ledang, Johor, West Malaysia. Span width: ≤ 7-8cm probably. Behavior: The spider will burrow herself a way down. Furthermore, they’re extremely fast, which makes a good look on these rather rare. Persistent provocation can result in a bite. Sexual dimorphism: Yes. Adult females show an incredibly beautiful intense iridescent blue coloration. The coloration on adult males is creamy/pinkish overall with black femora. Females are remarkably bigger than males. Legs (and especially the leg pair 1 & 2) are longer in males. Psednocnemis brachyramosa inhabits the montane tropical rainforest slopes in West Malaysia. Extremely warm air temperatures are not rare for the region. Dense treetops, however, block the sun’s way towards terrestrail area. Furthermore, the spider can be found in a burrow which provides protection against both predators and extreme environmental conditions. As rainforest ensure a certain waterflow, the burrows of Psednocnemis brachyramosa in their natural habitat are most of the time horizontally situated. Little is known about the natural history of Psednocnemis brachyramosa. Temperature: 21-24°C (day), 19-21°C (night). * Temperatures in which we keep Psednocnemis brachyramosa are rather cool in comparison to local air temperatures. * Rainfall is remarkably higher for 3 consecutive months. Adult: LxWxH: 20x20x20. 3x span width in height. Wet season: October, November, December. Dry season: None. Rainfall is significant throughout the year. Warmest months: February, March (with lower precipitation). Coldest months: None. Temperatures remain between 25-30°C. Minima never drop below 22°C. The coldest nights never drop below 20°C. Psednocnemis spp. are found in West Malaysia and Borneo, indicating the group most likely began on the Malay Peninsula, with a recent migration into Borneo. Breeding Psednocnemis brachyramosa is normally not that difficult. The females are often noticed to accept the male’s presence. • Introduce the male by 24°C and keep it steady the whole time. Make sure you don’t exceed 24°C. • Create “rainy season” (not “drainy”) for about 7-8 weeks directly after mating. • Don’t do anything special to trigger the female. Keep the substrate slightly moist and temperatures around 23-24°C. • About 5 months after mating the female will start making the cocoon. Deprive the cocoon, when desired, 6 weeks after she made it to encounter nymphs stage II. Store the nymphs at a humidity of 80-85% and a temperature of 24°C. Expect the sac to be filled with 120-200 eggs. In all known Psednocnemis spp. the embolus terminates distally with distinct distal spiral curl. 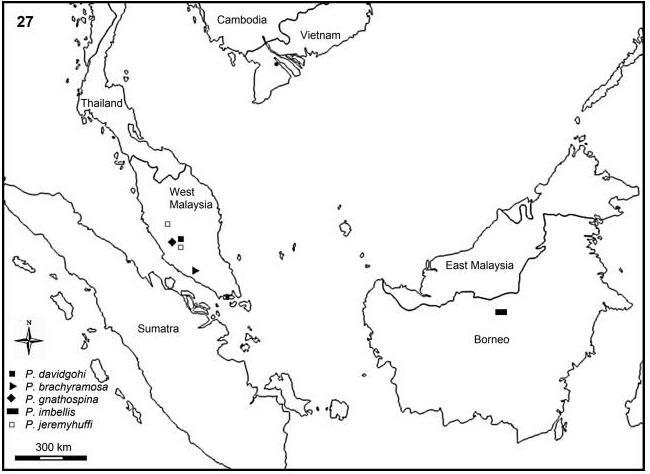 For an identification key of adult males (and females) in Psednocnemis I kindly advise you to read page 16 of “A new tarantula genus, Psednocnemis, from West Malaysia (Araneae: Theraphosidae) with cladistic analyses and biogeography of Selenocosmiinae Simon, 1889“, by West, Nunn and Hogg. • Psednocnemis brachyramosa is named after her size (Greek “brachy”) and her unique spermathecal morphology (Latin “ramosa’, which is referring to branched spermathecae)? • The intense iridescent blue is only present in adult females (post-molt)? • Blue spiders are common, but green spiders are rather rare (more information)? • Psednocnemis was based upon a distal spinal curl of terete embolus in males, presence of strong DD spiniform brush along retrolateral surfaces of coxa IV and reduction of setal counts/density of hair type 4, along proximoventral abdominal surface between pedicel and anterior book lungs? • Psednocnemis appears to be a sister group to Selenocosmia and Coremiocnemis based upon a single synapomorphy: female spermathecae bilobed with medial and lateral lobes similar length? 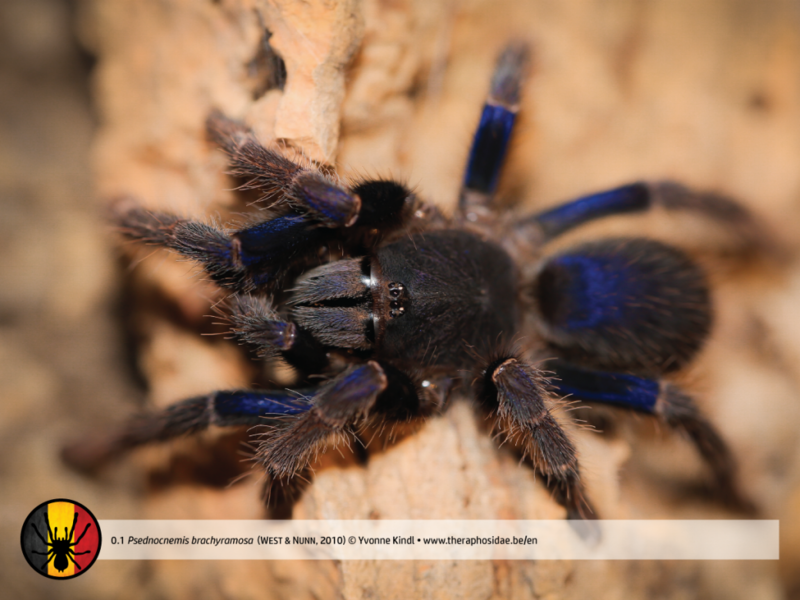 • About the blue color: Blue reflectance in tarantulas is evolutionarily conserved despite nanostructural diversity.  Special thanks goes out to Belgian Tarantula Breeding Team (S. S.) and Michał Morph Kluczny for sharing important information.